Regarded as the ‘jewel in the crown’ of the family resort, the Subtropical Swimming Paradise attracts tens of thousands of visitors each year. However, since opening in 1987, the water park’s last major update was a new raft ride in 2002, which meant it was in urgent need of a revamp. As part of its £15m facelift, the facility is currently being extended to include new raft rides, toddler pools and even a children’s adventure cove. What’s more, this state-of-the-art project will see the addition of The Tropical Cyclone, a high-thrill ride where users can enjoy a zero-gravity drop while on a four-man inflatable float. To ensure the longevity of the renovation, it was vital that the concrete used in the construction featured long-wearing water-resistant properties suitable for protecting the water park from water damage and damp. As such, the natural choice for DBM Construction, working for principal contractor SDC, was to use Aggregate Industries’ Watertight solution, a versatile range of specialised ready-mixed concrete designed to protect a structure from water ingress or to retain water within a structure. In total, Aggregate Industries supplied 2,000m3 of custom blend Watertight, made using the BASF’s MasterLife WP 799 high performance integral waterproofing system for wet cast concrete incorporating combined waterproofing and superplasticising components. As an integral waterproofing solution, Watertight does not require the use of secondary systems of waterproofing protection, which may be complicated and time consuming to install. By using this innovative solution, the contractors were also able to build a high-strength structure sturdy enough to support The Tropical Cyclone. This included an extensive 400mm ground slab and retaining walls that reached a thickness of 450mm – a substantial structure when considering that the minimum dimensions for a grade 3 concrete solution is 200mm. As one of the most popular holiday parks in the region, a key challenge of the project has been carrying out work whilst the water park remained open to guests, resulting in strict access times and all vehicles are escorted on site for the safety of holiday makers. With this in mind, Daniel Tunbridge, Territory Sales Manager at Aggregate Industries and his team worked tirelessly with BASF to co-ordinate a consistent supply of concrete from the company’s plant in Mansfield and was able to ensure as little disruption to holiday makers as possible. 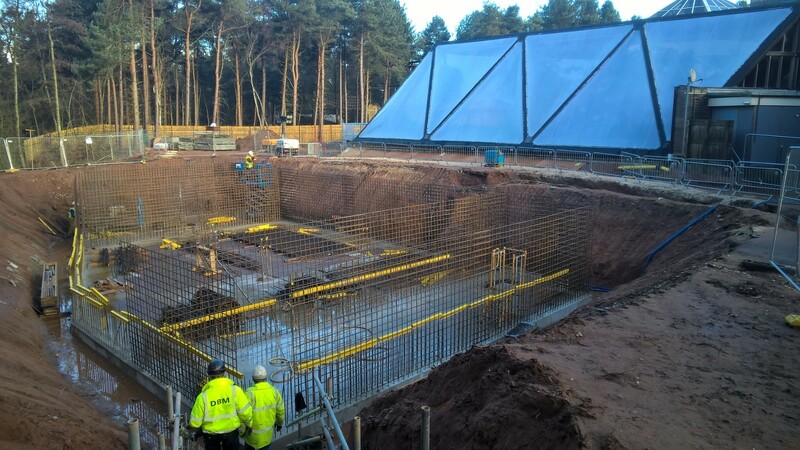 Daniel King, General Manager at Aggregate Industries, said: “Regarded as the ‘jewel in the crown’ of one of the most popular holiday resorts in Nottinghamshire, the high-profile revamp of the Subtropical Swimming Paradise water park at Centre Parcs Sherwood Forest clearly demonstrates the value of a tailored approach to concrete specification.